These small yet well-built machines are probably what most people would picture when thinking of typical Stock Cars and the racing is certainly the old-school brand of crash and bash entertainment. Designed with strength and brute force in mind these small 1300cc hatchbacks are built to last, and the drivers are some of the toughest in the sport with many former Banger racers among the ranks. Despite the weight of their heavy duty armouring these cars are surprisingly fast, and with big grids commonplace crashes and rollovers are almost a certainty in this rough-and-tumble formula although heavy follow-ins are not permitted. 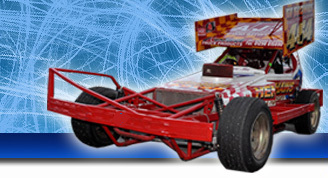 The “Ironclads” are popular all over the UK from Scotland to the south-east, and their annual visits to the Midland tracks are always looked forward to by Stock Car fans.